A while back my friend Shirley told me about her favorite restaurant but I never paid much attention to it, until the day we decided to meet there so I could experience the reason for her love for this particular eatery. At first, I did not take to the casual atmosphere in which the restaurant is run. But, over time, it became among my favorites in the city for breakfast or lunch. It has a charm that no other restaurant I know has. So here I am reporting to my readers. Kobi was born in the small town Giv’at Olga, Israel, to parents who arrived in Israel from Tunisia in the early 1950s, after being expelled from Tunisia, which was hostile to Jews. His mother is a good cook, so customary Tunisian food is her expertise. “When did you know that you want to be a chef?” I asked. “In my past life I think I was a watch maker. I love watches and I am time conscious and precise,” Kobi said, avoiding my question. After high school, like all Israelis, Kobi served in the military, and he was a health inspector. Upon ending his military service, he signed up to study in the Tadmor Hotel and Culinary School, pastry division, which he completed with honors. During his studies, for practice, Kobi worked in the Tel-Aviv Hilton hotel kitchen. For the young man, from a small town, the experience was an eye opener. The hotel’s kitchen staff liked him and asked him to join their team after he graduated. And so he did. He worked at the Hilton for three years. During that time, the hotel sent Kobi to take advance pastry courses in the Geneva Hilton, Switzerland. After leaving his post at the Hilton, Tel Aviv, Kobi took pastry chef posts with several restaurants in Tel Aviv while also teaching courses, as a freelancer and continuing his advance studies courses, which he took in several European countries. One day, at the age of 32, Kobi decided to pack up a suitcase and go to the United States. It was just after the disastrous 9/11 event and new immigration was the last issue the government wanted to deal with; staying legally and permanently and getting a job was not an easy task to achieve. “People did not see the correlation between an Israeli and French pastries,” he recalls. Kobi made his debut in San Francisco where he spent his first three years in America. Luckily, one of the top and best restaurants in San Francisco asked him, among other chefs, to prepare a few sample pastries, as part of an application for a position. He was selected for the position and was sponsored by the owners so he could work legally. Eventually, “Unique Pastry” in the San Fernando Valley sponsored him, through which Kobi obtained his US permanent residence. Now free to do as he wanted, Kobi decided to open his own restaurant, offering mainly pastries. However, as it turned out, he now offers more food than his pastry specialty. Opening the restaurant in Beverly Hills was a lucky fluke. “I was looking for a partner to invest, but no one jumped on the offer; it turned out for the best,” he admits. Kobi took loans and used his credit cards to open his small, but charming, restaurant where you can sit inside or outside. “This mall was empty till I opened,” he tells me. Today, to park your car in the small mall’s parking lot, you need to use the valet parking service. Kobi’s restaurant is constantly busy and the list of permanent patrons is forever growing. It has become a social center for people with Israeli and European background as well as Americans with European-Middle Eastern finesse. The food is unique and reasonably priced, with French-Tunisian and slight Middle Eastern injected flair. It is prepared from scratch, served in small quantities, with a decorative, elegant finish. “The thing people most like is my plum galette and almond croissant. I make my own jams and confitures. 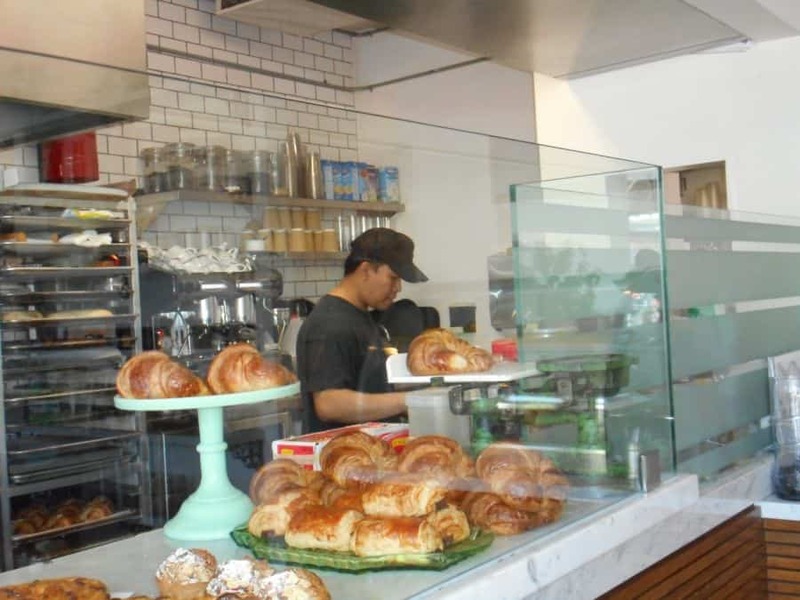 Whatever I can I prepare on the premises,” Kobi, who is always in a pastry chef apron attire, says. “What message do you have for the readers, for the world?” I asked. “My restaurant is tiny and thus has its limitations. I only use 10% of my talent and culinary knowledge here. Sometimes I look at my patrons and I feel bad as I know I can do more and I wish I could offer them so much more.” But Kobi does not need to worry; the restraints are definitely complemented by the lovely taste and the ambient experience, which will grow on you just as it grew on me. As I was getting ready to leave, a patron sitting at the table next to me approached me saying, “You have a fabulous restaurant and the food is delicious.” I guess she thought I was the proprietor, never mind, she was right. 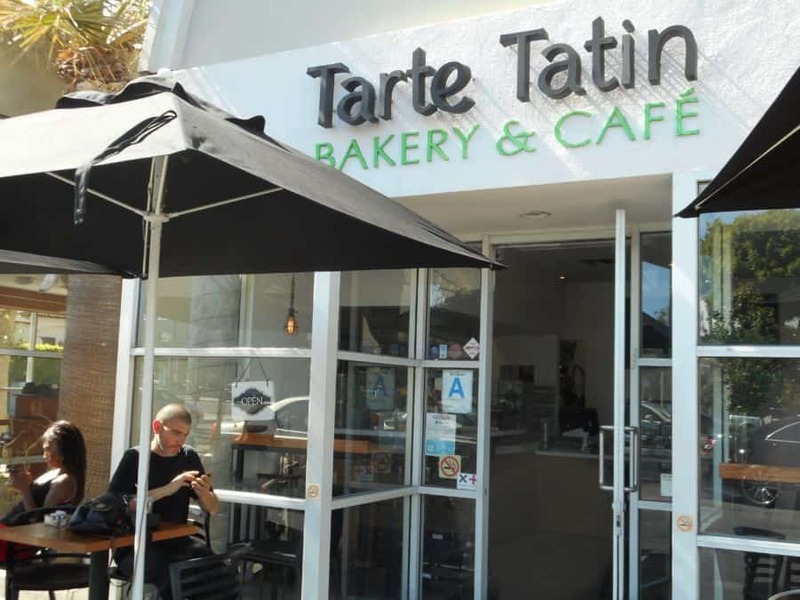 To many patrons Tarte Tatin reminds them of a cafe in a trendy street in Israel. It is much like little fashionable Israel in Beverly Hills. Go experience Tarte Tatin; you may like it just as much as I and so many others do.